While the Gadhimai mass slaughter of animals went ahead on November 28th and 29th, it could be prevented from happening in 2019 if we keep the pressure on. The Gadhimai festival takes place every five years in Nepal. Typically, half a million animals including buffalo, pigs, goats, sheep, cows, rabbits, and rats are transported long distances and corralled into fields together, where they are killed (usually beheaded with huge knives) as a sacrifice to the goddess Gadhimai. CCFA made numerous attempts to communicate with Mr. Dilip Paudel at the Napalese Embassy in Ottawa, as well as writing many letters to the Nepalese government. Groups such as Humane Society International met with Nepal's prime minister, its president, and the chief priest of the Gadhimai Temple. 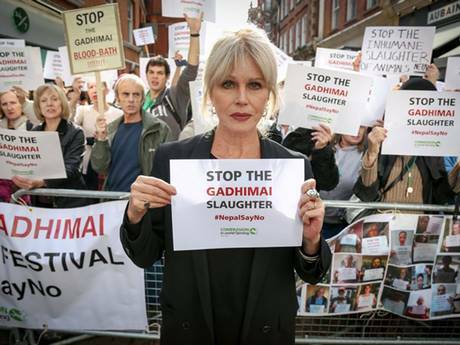 Many activists around the world worked to end the slaughter, such as Joanna Lumley, pictured here, who teamed up with Compassion in World Farming. Some brave activists also came to bear witness to it. While the slaughter went ahead, we believe the global effort to stop it is making a difference. Approximately half as many animals were killed in 2014 compared with 2009. This is due largely to the Supreme Court of India’s ban on movement of animals to Nepal. Contact Prime Minister Koirala by email at info@opmcm.gov.np or by mail at: Nepali Congress, Smriti Bhawan, B.P. Nagar, Lalitpur, Nepal. Half of Loblaw’s customers identify animal welfare and environmental sustainability as their main concerns related to agriculture. This was part of a message delivered recently by the sustainability director for Loblaws to Egg Farmers of Ontario. Agopian explained that 30% of Loblaw’s $42 billion in annual retail sales comes from its own “control brands” such as President’s Choice and Free From. That’s a higher percentage than any other supermarket in Canada or the U.S. This translates to a significant influence in how foods are produced. If Loblaw’s customers are looking for more humane, sustainable options, Loblaws will be asking the same of its suppliers. As a long-time Loblaw shareholder, CCFA director Stephanie Brown has been collaborating with the retailer for a number of years, focusing in particular on production and labelling of cage-free eggs, and an end to sow stalls. Clearly, these kinds of issues are front and centre in customers’ minds; Melanie Agopian says the number of questions she’s received regarding animal welfare have doubled in the past year. At last count, almost a quarter of a million chickens and turkeys had been killed in B.C. 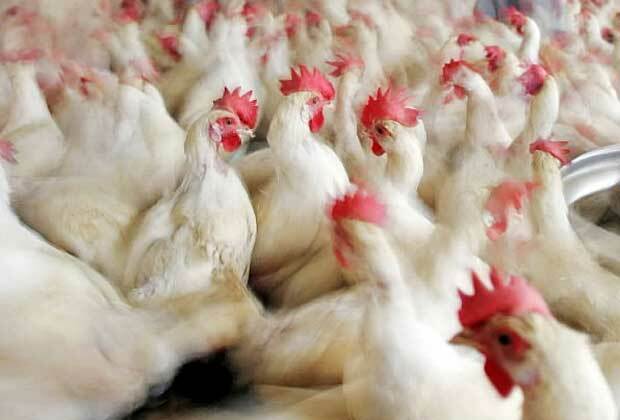 to prevent further spread of the H5N2 strain of avian flu. This is the fourth outbreak in the Fraser Valley in 10 years, and experts are citing dense factory farms as a key contributor to the spread of the disease. “It is high-density chicken farming that gives rise to high-virulent influenza viruses,” said Earl Brown, a University of Ottawa microbiology professor specializing in flu virus evolution. Brown was quoted in a recent article in the Vancouver Sun. As the article points out, an outbreak in the Fraser Valley in 2004 resulted in 17 million birds being wiped out. Since then, the article notes,"various biosecurity measures have been put in place by the poultry industry. Yet, still the virus, in one strain or another, emerges with frightening persistence." Trade bans have now been placed on poultry from either B.C. or all of Canada. Meanwhile, outside Canada, avian flu also appears to be taking its toll on wild birds, and is being blamed for human deaths. In Egypt, for example, the recent death of a 3-year-old boy brings the avian flu-related death toll in that country to 27. With chickens and turkeys being raised in densities of up to 20 birds per square metre -- all eating, sleeping and defecating in the same place -- it's very likely that these diseases will continue to take their toll. Starbucks has announced a new, more animal-friendly policy calling for cage-free eggs and use of controlled-atmosphere killing for chickens. 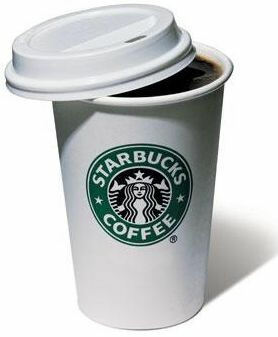 The cage-free policy is North America-wide, and applies to not only shelled but also liquid eggs, which are bought in large volume for Starbucks’ pastries. The policy is part of a larger push by the company to "ensure we offer food made with ingredients such as cage-free eggs, gestation crate-free pork, and poultry processed through more humane systems such as CAK (controlled atmosphere killing)." CAK is something we at CCFA have advocated for a number of years, especially given the inherent cruelty in chicken transport and slaughter systems that have again come to light in the recent Maple Lodge Farms court case. In a CAK system, the birds are removed from transport trucks in their "drawers", and are placed in a chamber and exposed to high levels of gas, which kills them. Typically, gas is used only to stun the birds. Electrified water baths are also used for stunning. Methods vary between broiler (meat) chickens and egg-laying hens. While current CAK systems in North America generally use carbon dioxide, CO2 has proven to be aversive to the birds, causing them distress during the gassing process. Gasses such nitrogen and argon are more humane; however, they also are more expensive. CCFA commends Starbucks for making this commitment, and we hope decisions like these will continue to push animal welfare standards higher. We also encourage people to look for meat- and dairy-free alternatives like Starbucks' soy latte; if you haven't tried one, you're in for a treat. Zoocheck Canada is a national charity that focuses on the well-being of wild animals. Established in 1984, it works to prevent the abuse, neglect and exploitation of wild animals through investigations, public awareness and outreach, and legislative action. Current efforts centre around issues such as roadside zoos, and wild animals as performing animals, as well as campaigns like ‘Keep Whales Wild’ and ‘Wild Animals Do Not Make Good Pets!’ In addition, Zoocheck works with other animal protection groups on issues such as the Ontario Spring Bear Hunt. It also runs valuable workshops for students of all ages in Humane Education, and participates in many public speaking events. Learn more about them here. Kudos to Zoocheck for their efforts for animals, and thanks for being a CCFA member organization. 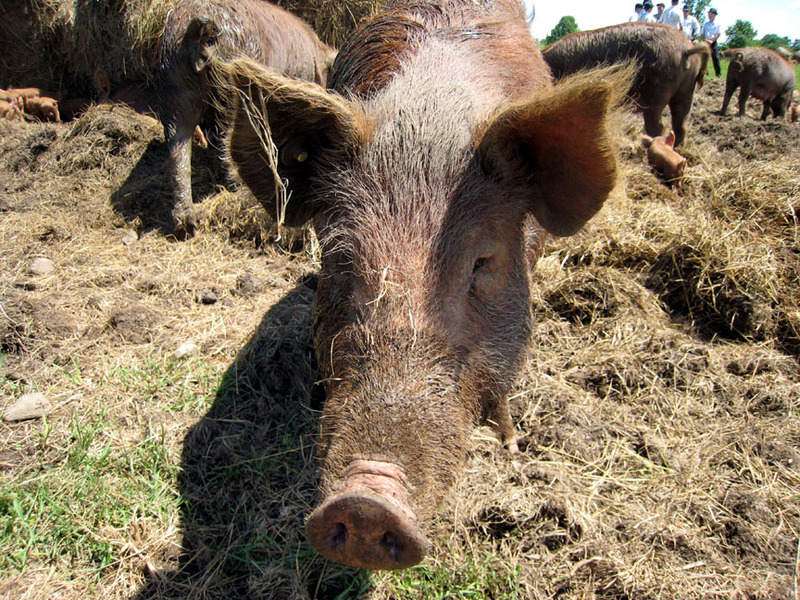 CCFA is one of several Canadian animal protection groups that are asking federal Agriculture Minister Gerry Ritz to change Canada’s outdated farmed animal transport regulations. The groups all signed a letter to Minister Ritz in November. 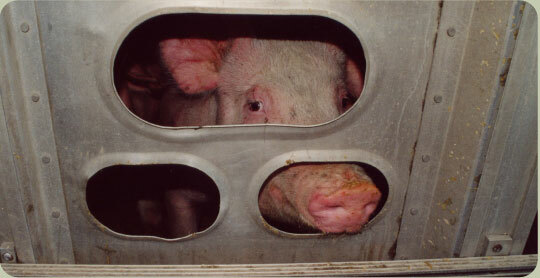 The letter was initiated by Animal Justice Canada, a legal organization based in Toronto. • transport companies and personnel are trained, tested and licenced with respect to animal welfare criteria such as behaviour and physiology. Canada’s transport regulations have not been updated in more than 3 decades. The federal government has been promising changes for many years, but so far, there have been none. Last October, a mom and daughter on a visit to a pumpkin farm encountered a calf chained up alone. They inquired about it — and set the wheels in motion for not one but two rescues. 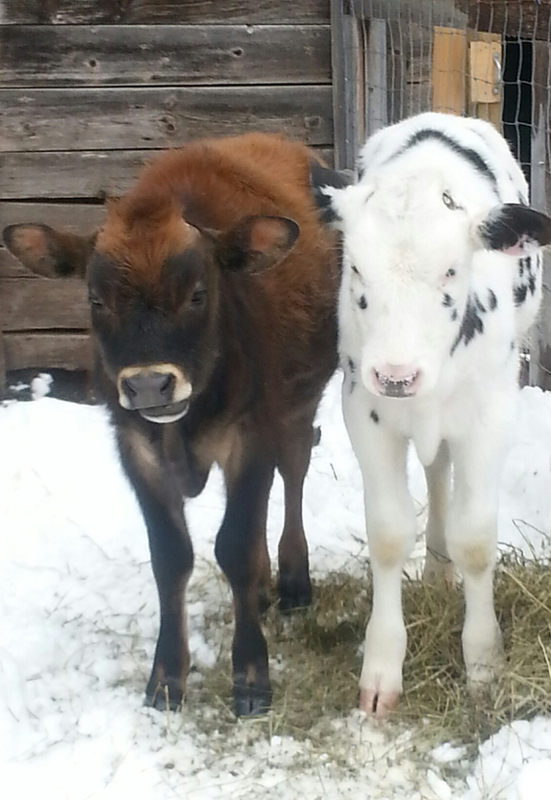 Bali and Kai are among the newest residents at Wishing Well Sanctuary. Previously bound for slaughter, they will now live in a caring environment with lots of friends. Still adjusting to kindness from humans, the calves are currently living with the goats and pot- bellied pigs until they grow big enough to join the older cows. Cattle are big financial commitments for any farm sanctuary, so taking on two at once is a big undertaking for Wishing Well. Thank you Wishing Well, from all your supporters! Have a rescue story you'd like to tell us? Or a simple vegan recipe you want to share? We'd love to hear from you! Email us at info@humanefood.ca. Blend tofu and Silk in blender until creamy. Melt margarine in pan, and add other ingredients except cornstarch. Heat over medium-low until hot, stirring often. Whisk in cornstarch mixture and heat until bubbly, allowing sauce to thicken. Heat until thick, but don't let boil again. Once mixture reaches desired consistency, add chopped fresh parsley, basil, chives, etc. Pour over pasta, rice or potatoes, and mix with veggies, vegan protein and enjoy!